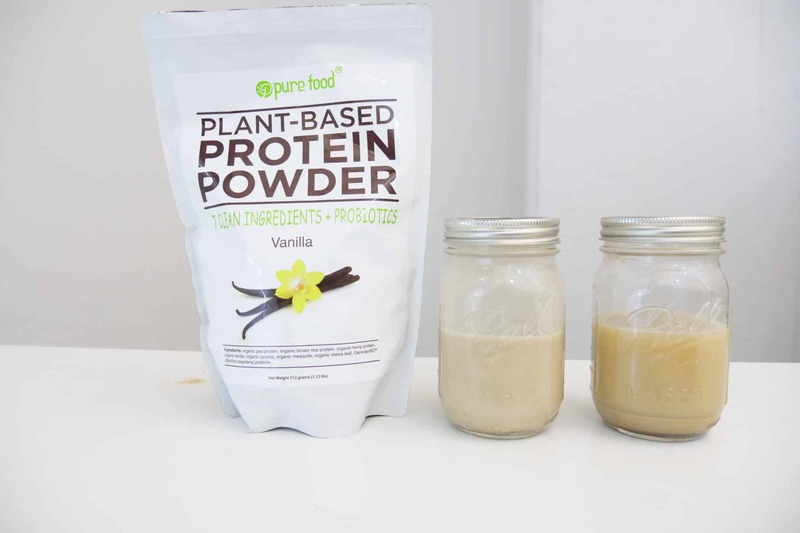 Pure Food Company is a relatively new startup in the supplement space which currently offers just one product in two flavors: Plant-Based Protein Powder. 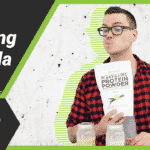 The company was founded by Scott Christ because he was frustrated with protein powders, claiming that he couldn’t find a single “clean” protein powder on the market. He says that 99.9% of “all natural” protein powders are mostly hype, containing ingredients that he considers inferior: “highly processed, chemical-ridden fillers, additives, sweeteners, gums, and other hidden junk ingredients.” Importantly, he includes “natural flavors” in the junk pile, citing research stating that natural flavors are often 80 to 90 percent solvents and preservatives. No bueno, says Christ. It’s pretty unusual in that it’s not just organic and plant-based, but it’s made from just seven ingredients plus some probiotic bacteria — and there ingredients themselves are pretty unusual. Let’s take a look at the vanilla flavor. One scoop is 62 calories: 10 grams of protein, 4.5 grams of carbohydrates, (2 grams of fiber, less than a gram of sugar), and 1 gram of fat (no saturated fat). There’s no cholesterol, 3 percent of the daily intake of sodium, 15 percent of your daily iron, 8 percent of your magnesium, and 2 percent of your calcium. 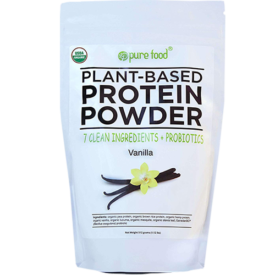 All seven ingredients are organic: pea protein, brown rice protein, hemp protein, vanilla, lucuma (a fruit that tastes like a cross between a mango and a sweet potato), mesquite (a plant with a sweet and piney flavor), stevia leaf, and the probiotic Bacillus coagulans. There’s no information regarding how many probiotic bacteria there are in a serving. 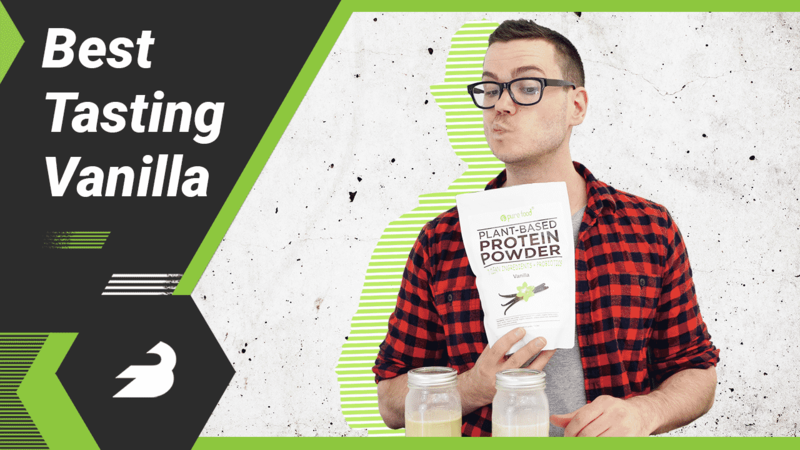 This is a protein powder that’s sort of defined by what it doesn’t have: soy, dairy, egg, GMO, gluten, grains, corn, additives, gums, artificial ingredients, or added sugar. But the ingredients it does have are top notch. The pea, brown rice, and hemp proteins should provide a complete amino acid profile, and I’m a big fan of the added probiotic bacteria, which may help to improve digestive health. Again, I’d have liked to know how many probiotic bacteria it has — the Pure Food representative I spoke to didn’t know, said she’d call me back, and I didn’t hear back. Still, I like the bonus bacteria. It’s very low in calories with just 62 per scoop. Pure Food Company seems to know this, because they also include the nutrition for two scoops if you want a more calorie-dense shake. It’s a decent source of fiber with about half the carbohydrates coming from fiber, but I was especially impressed by the 15 percent of your daily intake of iron. The 8 percent of your magnesium intake isn’t too bad either. What I would have liked to know is if there were any vitamins at all in the product. Those three minerals are the only ones included on the nutrition label, even though it contains fruit and some pretty nutritious seeds and legumes. I imagine there are some B-vitamins, but I don’t really know. 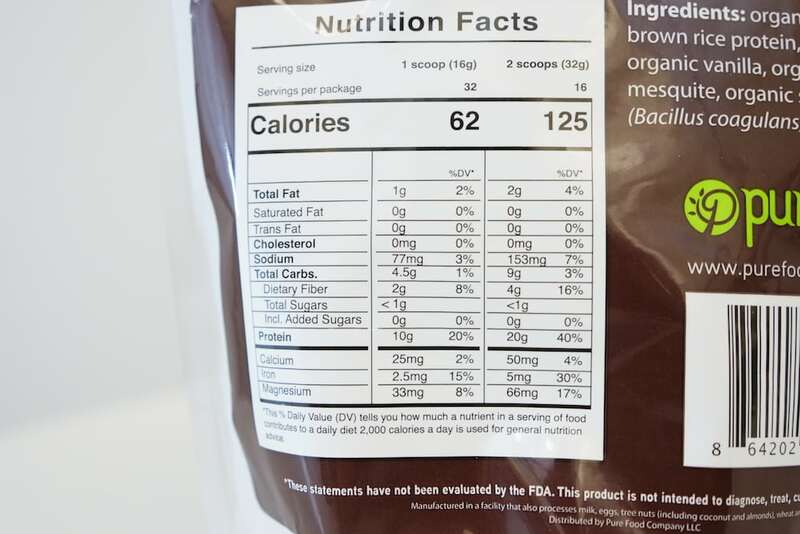 One bag of 1.12 pounds has 32 servings for $40. That comes to $1.25 per serving or 12.5 cents per gram of protein. If you subscribe to a monthly delivery, the price drops to $1 per serving or 10 cents per gram of protein. Man, this tasted great. 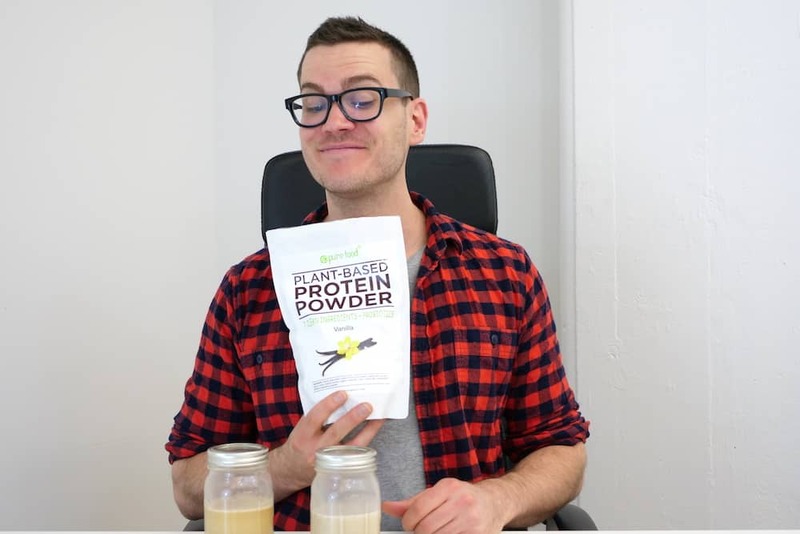 Most vegan vanilla protein powders just taste like nuts, but this one actually did taste like a strong vanilla. Maybe it was the lucuma, maybe it was the mesquite, but this has a unique taste that’s really enjoyable. I preferred it with almond milk, since it added some sweetness and creaminess to the endeavor, though it mixed a little better with water. The only real issues you can have with a product like this is the price, the lack of nutrition info, and the fact that it’s made in a facility with dairy, eggs, and a few common allergens like wheat and soy. If you have extremely sensitive allergies or shallow pockets you may want to steer clear, but otherwise the taste and the macros of this product make it one of my favorite vegan protein powders.